Avalon Meat Candy, 9770 S. Maryland Parkway, Suite 1, opened about two months ago and is the culmination of owner Christian Petersen’s passion for beef jerky. His love, which has lasted more than a decade, originally took him on a quest to find the best beef jerky. Retired from the U.S. Coast Guard, Christian Petersen has a special spot in his heart for other veterans. 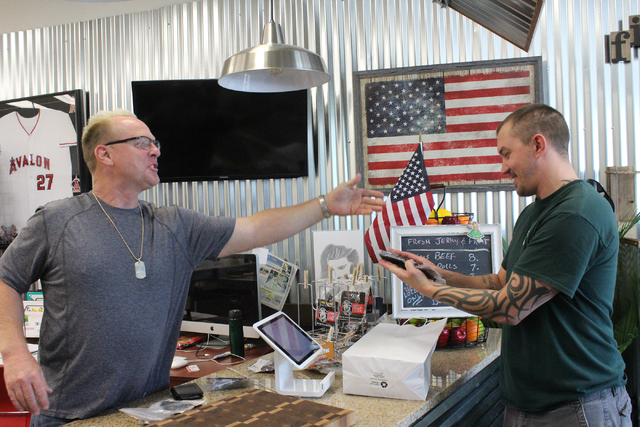 So when he finds out an Army veteran is inside his store, Avalon Meat Candy, he makes sure to not only introduce himself but also to give the man a discount. Avalon Meat Candy, 9770 S. Maryland Parkway, Suite 1, opened about two months ago and is the culmination of Petersen’s passion for beef jerky. His love for the snack, which has lasted more than a decade, originally took him on a quest to find the best beef jerky. He thought he had found it in Huntington Beach, Calif., but the store there would always run out. Petersen, who lived in California at the time, would have to get up early to make sure he got there in time. Instead of relying on someone else, he decided to figure out how to make his own. “And now I have the best,” Petersen said. After his time in the Coast Guard, Petersen started Avalon Electric, which provides service to Las Vegas and parts of California. His business caused him to move to this area. Whenever visiting clients or prospective business partners, he would also bring his signature jerky. “It got to a point where people would say they didn’t need my company’s service but wanted to know if they could have jerky,” he said. Soon a hobby and gift for friends turned into a business venture. 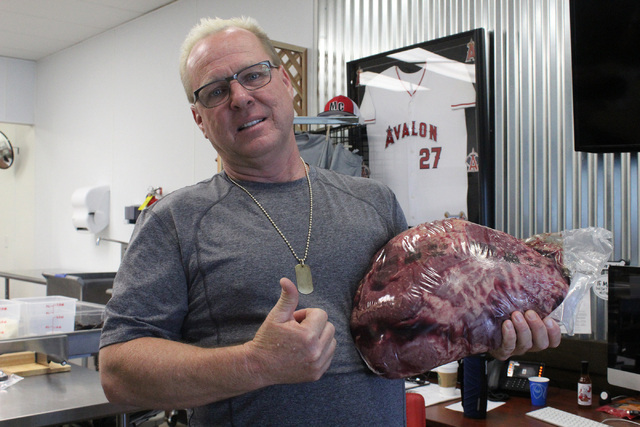 Petersen said the secret to making good jerky starts with buying the best meats — Avalon Meat Candy goes through 400 pounds each week. 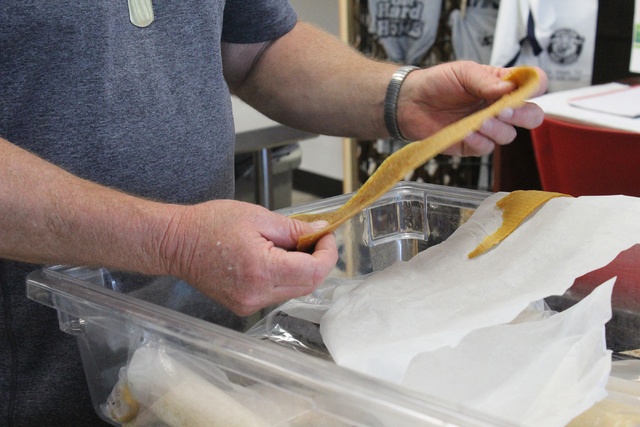 In addition to using only top sirloins, Petersen also tries to get ingredients for the jerky, such as the honey or spices, from local vendors. He said his staff has had fun taking those ingredients and coming up with flavors such as Fireball whisky flavor and Jamaican jerk. He is currently trying to make a flavor out of the beer Shock Top — he wants to start pairing jerky with different beers. And wanting to branch out from just beef, he also decided to expand to marinades and fruit rolls. The merchandise has attracted people from all over. Since discovering the store, Henderson resident Chris Ryan said either he or his wife have stopped by at least once a week to stock up on jerky. He stops in and scans the bins of different flavors to see if there is anything new. Petersen asked Ryan about flavors he hasn’t tried. Then, Petersen found those flavors and gave Ryan a taste. “I’ll take two of those,” Ryan said, adding spicy honey garlic to his order. Petersen takes time to interact with customers as they come in. If he discovers they are veterans or police officers, he makes sure to provide discounts. “If a girl is in here buying jerky to send overseas to her brother, husband or whatnot in the military, you better believe she won’t have to pay for that,” he said. Each day, Petersen stocks the shelves with items. But if people want something they don’t see, they are welcome to ask for it. Petersen said if people have suggestions or want a flavor to be hotter, he can custom-make it and have it ready the next day. “So, if you think the teriyaki should have some hint of pineapple, we can make that for you,” he said. Already people are asking Petersen his plan for the future. He intends to offer shaved ice during the summer. Beyond that, he said he is open to ideas. “People ask if I would open a second store,” he said, adding that, while he wouldn’t turn the idea down, he doesn’t want to take away from his current location. Avalon Meat Candy is open from 6 a.m. to 8:30 p.m. Monday through Friday and 8 a.m. to 8:30 p.m. Saturday and is closed Sunday. Call 702-636-5000 or visit avalonmeatcandy.com. Hours: 6 a.m. to 8:30 p.m. Monday through Friday; 8 a.m. to 8:30 p.m. Saturday; closed Sunday. Visit avalonmeatcandy.com or call 702-636-5000.